You always want to find the appropriate words to congratulate newlyweds whether you are writing in a card or writing a speech. It is sometimes difficult to find those right words that express your heartfelt congratulations to the bride and groom. It is important to use words of congratulations for a wedding card to let the bride and groom know how happy you are for them. And even more so if you are making a speech for them in front of a room full of their closest family and friends. You can create your own words of congratulations for a wedding by following these simple steps. Find a quote or romantic saying. Tell them how happy you are for them and how lucky they are to have each other. And last but not least congratulate them or wish them well. By following these steps, you will find the best words of congratulations for a wedding and best of all, it is from your heart. Although, we all know that sometimes putting your feelings into words is not always easy. You may find that using words of congratulations for a wedding that someone else wrote says exactly what you are looking for and that's great too. The important thing is that the bride and groom feel how happy you are for them. Special cannot explain the feeling we got watching you both share your love for one another. Today is only the start of something great! You two together is greatness. Love can conquer, and today the two of you have proven that! Your wedding day is here and will be gone too fast, but your love will go on forever. Congratulations! May your love grow each day from here on out. And may you treasure the love you share. Congratulations on this special day. Congratulations and all the best on this very special occasion. May this day always be a reminder of the love you two will always share. Wishing you both a world of happiness as you take your first steps together as husband and wife. From this moment on, you will be one. A couple who will love and cherish each other. Wishing you a lifetime of happiness. Congrats on this most joyous union. We wish you only the best in your future to come. We are so very happy for you both and wish you nothing but the best for your marriage. Today was perfect, just like the two of you are for each other. The love you both share is an inspiration to all. May we all be so lucky to find someone to love us back just like the two of you. We hope from this moment on your lives will be filled with love and laughter. Congratulations to you both. Congratulations on a beautiful commitment! One which the two of you will treasure forever! On this very special occasion, may you always remember the love you shared on this day. Wishing you a lifetime of love! Two soles connected by one love, our wish for you is eternal love. Congratulations! Today is a wonderful day, and that is because the two of you finally made your way to each other. It is so wonderful to see the two of you sharing your vows with one another. Best wishes in your future together. One can only imagine the way you both felt with you were pronounced husband and wife. Many get married but your feelings are so personal and individual. Know how special this union is between the two of you. And cherish it! May this day be only the beginning of your happiness! And may you receive from each other exactly what you've always wanted. To have found your one perfect match is a marvelous thing! And we can only share our happiness for you both. How beautiful a commitment is, and how special your love must be. Never forget the way you felt for each other on this joyous of days. Congrats to a wonderful couple who will make each other very happy in the years to come. May your years together be filled great love and amazing laughter. Love is a blessed thing that should never be wasted. And the love we see in both of you shows us, you will never waste this love between you two. You may find that best wishes can come from many different places. Finding the right one to say what you need it to say may take time. You may find the words of your choice in a poem, or a quote. Or you may find that perfect wish in a card verse or even a song. Keep your mind open to the possibilities and you will find the perfect wish to send along to the newly married couple. This time in a couples life marks the beginning of a new phase. Its a time they will commit to each other their love and their lives. When you are the spectator you are honored they have chosen you to celebrate this momentous occasion with them. And you will want nothing but the best for them in their new lives together as husband and wife. So now the search will being. You want the perfect card, the perfect gift that they will not only treasure but that will also be useful to them. You want to give the perfect toast and raise a glass to this wonderful commitment. But you don�t know where to start. Finding the card, well that can be easy if you go to the store and purchase one of their congratulations card from their large selection or you can make one yourself to make it more personal. Whichever you decide, you still need to figure out what you are going to write to the newly wedded couple. A quote or saying would be a nice addition. There are many around that would be quite sufficient. 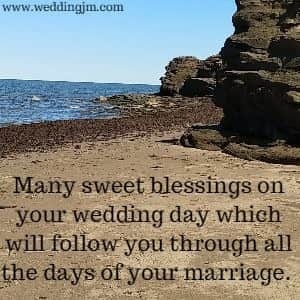 You may decide that a poem or blessing would be an even nicer addition to your marriage wishes. But what about that marriage wish. You could most likely find a very nicely written wish on the internet. Or, you could personalize it even more and create one that says more than just any pre-written wish could say. But where do you start? A nuptial wish can be written very easily, it just depends on what you want to say. Start it off by saying who it is to. 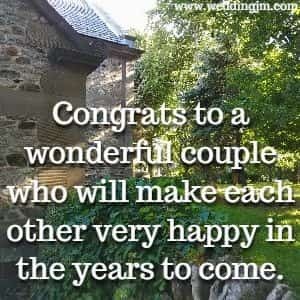 For example, �For my darling Niece and her new Husband, Darlene & Jacob� or �To the newest newlyweds to our group, Jane and John�. It can be as simple as just saying, �To Jack & Jill�, or more personal as we�ve already stated. Next you will want to congratulate them on their commitment to each other. There are many ways of doing this. Here are some examples, �I can�t tell you how happy we are for you both�; Congratulations on your commitment to each other�; �Cheers to you both on this joyous of all days�; Way to go on making such a beautiful devotion to each other�. You will then want to tell them what you want for them and their future. Some examples of what you could say are, �We wanting only the best for you both and hope you will find all the happiness in the world�; May your promise to each other get you through troubled times, may your love keep your hearts open and may your fondness for each other stay as strong as it was on this day� or best wishes for your future and happy memories of your past. You will likely end your wishes for card with your name. But before your name or names you will likely sign off with a, sincerely, truly, with all sincerity, with love always, love or just simply, from. We hope this has been helpful in showing you how there are many ways to send your hopes and desires for the newly wedded lovers. And most of all we hope you can see that writing your own union bid is not a difficult task when you break it down. You can easily write something loving and caring. But always remember a quote, saying, poem or even words to a beautiful song are always a nice addition to any wishes.